When de facto ruler of Saudi Arabia Mohammed bin Salman visited Tunis seeking to burnish his image, Tunisian protesters turned out en masse to oppose the Crown Prince’s presence in the country and criticize President Beji Caid Essebsi. SNJT (National Union of Tunisian Journalists) unveiled a banner that reads: "No to desecrating Tunisia, the land of revolution," protesting the visit of the Saudi Crown Prince following the Khashoggi assassination. Bin Salman’s visit was part of a tour of several Arab countries while en route to the G20 meeting in Argentina. The tour was an evident attempt to redeem himself amidst global outcry over the murder of dissident Saudi journalist and Washington Post columnist Jamal Khashoggi in the Saudi consulate in Istanbul, a crime widely attributed to the crown prince himself. 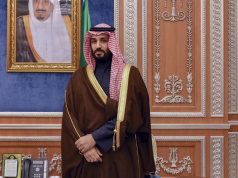 While Saudi Arabia, after its initial vehement denials, ultimately admitted Khashoggi was murdered, the kingdom has staunchly denied MbS’s involvement. Nevertheless, an official CIA investigation concluded, based on intercepted communications and other intelligence, that it was almost certain that the Crown Prince himself ordered Khashoggi’s assassination. Tunisian protesters decried MbS’s visit as a “desecration of Tunisia, the land of the revolution,” referring to the 2011 Jasmine Revolution that had sparked the Arab Spring and toppled dictator Zine el-Abidine Ben Ali. Hundreds of Tunisians marched down Habib Bourguiba Avenue in downtown Tunis once again, this time fearing that the Tunisian government is letting the democratic ideals of the revolution erode. Outraged with bin Salman both for Khashoggi’s killing and Saudi Arabia’s unrelenting aggression in the catastrophic war in Yemen, Tunisian protesters expressed their feelings of betrayal by Essebsi’s unwillingness to hold the Crown Prince accountable. The government’s welcome of the de facto leader of one of the world’s most repressive countries made Tunis’ ostensible, post-revolution democratic gains ring hollow. The fact that Saudi Arabia had offered refuge to the deposed Ben Ali in 2011 rubbed salt in the wound. After the Saudi Press Agency stated that bin Salman would visit Tunisia and other Arab countries at the invitation of their leaders, Tunisians castigated President Essebsi for opening the door. His spokesperson claimed in response that Essebsi had sent no invitation and that the visit was simply in conjunction with the G20 summit in Argentina. However, Tunisian presidential advisor Noureddine Ben Ticha said that bin Salman was “welcome in Tunisia” because Tunis is trying to bolster relations with regional powers. A week after Khashoggi’s killing, Tunisia held joint military exercises with the Saudi Royal Air Force. The president’s spokesperson said that the killing of Khashoggi should not be used as a “means of pressure” on Saudi Arabia. 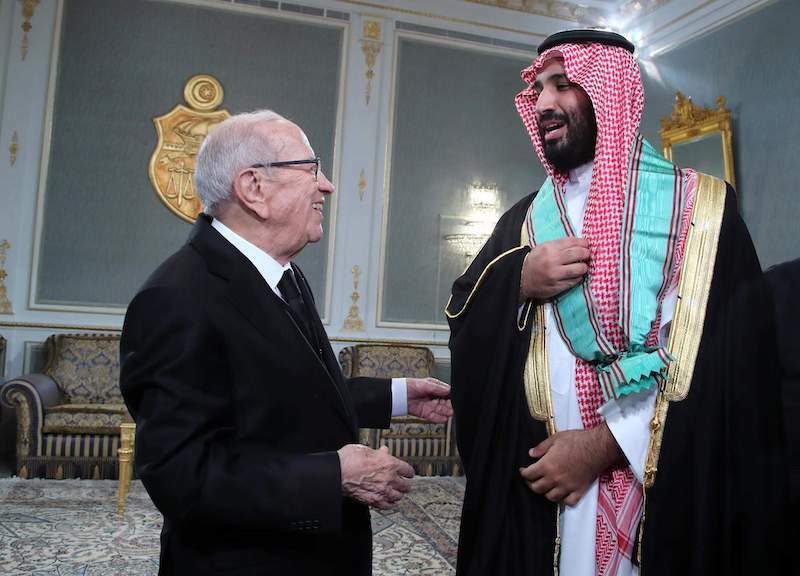 Although pictures appear to show Essebsi and MbS warmly greeting each other, the president’s office did little to pre-announce or publicize the meeting, suggesting he was aware that Tunisians would disapprove, yet followed through regardless. 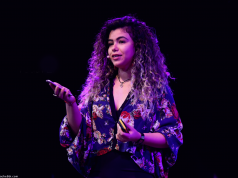 Organizations such as the National Union of Tunisian Journalists and the Tunisian Association of Democratic Women urged Essebsi to reject MbS’s visit. On Bourguiba Avenue, protesters held signs and shouted slogans: “The murderer is not welcome in Tunisia.” Some waved saws in the air, referencing Khashoggi’s alleged dismemberment. 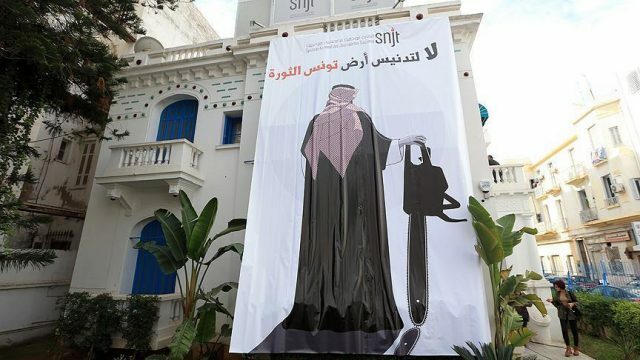 Posters showed Essebsi squirreling away money in exchange for cleaning MbS’s bloody hands, suggesting the president’s complicity in allowing MbS to get away with murder. Shortly after MbS met with President Essebsi, Ben Ticha announced that Saudi Arabia would give Tunisia a low-interest $500 million loan and an additional $140 million for unspecified purposes. In the Arab world, Tunisians alone have the freedom to protest Mohammed bin Salman’s visit. The Tunisian Journalists’ Syndicate, seeking to pressure Tunis into bringing the Crown Prince to the International Criminal Court, filed an official complaint against bin Salman, prompting an official investigation by the Tunisian judiciary. The freedom to protest and having a responsive judiciary are real successes in a region so stifled by institutional limitations on the freedom of expression. Similar to his stop in Tunisia, MbS’s recent visit to Egypt was met with a warm welcome by President Abdel Fatah al-Sisi and a handful of supporters. There, however, the protest has been largely smothered under al-Sisi’s rule. Despite gains in freedom of expression in Tunisia, some Tunisians who posted critical comments on the president’s Facebook page reported that their comments had been deleted, and some commenters have reportedly been banned from the page. Jamal Khashoggi began his last column for the Washington Post by pointing out Tunisia’s unique status as the sole “free” country in the Arab world. The country has not collapsed into chaos like Yemen or suffered dictatorship like Egypt. However, in light of Tunis’ friendly relations with Mohammed bin Salman, the country’s post-revolution democratic sheen, much lauded by Western democracies, appears to hide fundamental internal flaws. Tunisia has been struggling through a thorny and potentially destabilizing political shake-up and economic turmoil that has exposed a government disconnected from its people. Public sector labor unions have been calling for the right to a salary increase and condemning the government for submitting to pressure from the International Monetary Fund (IMF) to cut public sector money and fuel subsidies and keep public wages stagnant. The Tunisian General Labor Union (UGTT) led a strike of around 670,000 public sector workers (about six percent of the Tunisian population) on November 22 and has more planned. The IMF, whose impositions caused the 1984 “bread riots” in Tunis, once again has threatened to cease financing the country if its austerity measures are not adopted. Prime Minister Youssef Chahed faces a decision between heeding the will of the Tunisian public or that of the IMF. Chahed argues that Tunisia does not have the nearly $690 million needed to raise public sector wages and is dependant on the IMF for support. UGTT head Nourredine Taboubi blamed the failure of labor negotiations on the IMF, which he said has taken “the sovereign decision” out of the hands of the government. Tunisia’s unions and Tunisian MbS protestors have declared that “Tunisia is not for sale.” However, in the current churn of public discontent, Tunis appears to value foreign funding over popular opinion. This choice chips away at the hopes ignited by its revolution, an upheaval that has already shown the power of the Tunisian people to bring change when their government fails to listen.